It’s here and look at the venue of the National Finals in December. Cool! DAGUPAN City, Philippines, 06 July 2014 – Elite runners Rene Herrera and Lany Cardona set a swift pace for the 21-K division run at the 38th National MILO Marathon on Sunday in Dagupan City. Each received a cash prize of P10,000, a trophy, and a coveted spot in the National Finals on December 7 for their respective victories. “MILO’s Help Give Shoes is wonderful program which reaches out to underprivileged children who aspire to run and become future champions. I used to be one of those kids, and the advocacy continues to inspire me,” said Herrera. Cardona echoes the same sentiments. “What MILO does for the children is admirable, and I’m more than willing to contribute and help our aspiring athletes. We all share the same passion for running, and it’s great that the kids will be able to pursue their dreams,” she added. For 4 decades, the #MILOMarathon has been a venue for Filipinos to display their commitment & passion to #BUILDCHAMPIONS. And this year, they’re celebrating the 50th year of MILO in the Philippines by providing running shoes to the areas hit by Typhoon Yolanda. Register for the #MILOmarathon now to inspire these children to stand up again and reach for their dreams. To register, go to http://www.milo.com.ph. P10 from the registration fee will be donated to the “HELP GIVE SHOES” advocacy. 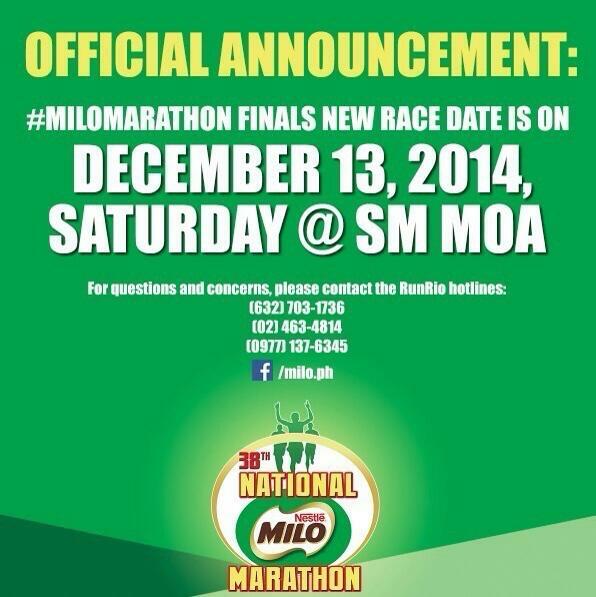 Race entry fee should be accompanied by one empty Milo 300g empty pack. 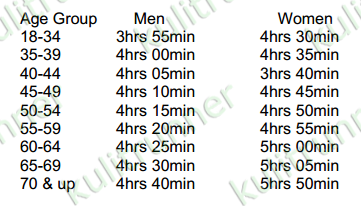 21km category is a Qualifying Race for PROVINCIAL LEGS only. Students should present a valid ID in order to avail of the Php80 registration fee. P 10.00 from the registration fee will be donated to the “HELP GIVE SHOES” advocacy. 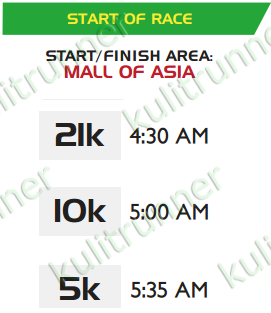 Participants must be 18 years and above on the race day to participate in the Half Marathon (21-K). Each will have to secure an official ‘Fit-To-Run’ medical certificate signed by a licensed physician within 2 months before race day. Participants must be 16 years and above on race day to be able to register and participate in the 10km race category. Participants must be 7 years and above on race day to be able to register and participate in the 5km Fun Run race category. Participants must be 7 to 12 years old on race day to be able to register and participate in the 3km Kiddie Run. They are required to have their entry forms signed by a parent/guardina and must submit a photocopy of their NSO birth certificate or current school ID. Participants below the age of 18 must seek their parental/guardian consent andd fill up the entry form where the parent/guardian is required to sign. a. 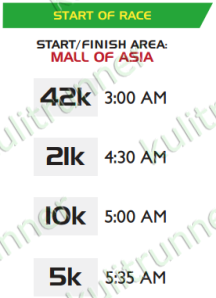 Male finishing the race within 1:15:00 and female finishing the race within 1:35:00 will qualify and get an all-expense paid trip to Manila. It is their responsibility to contact the national race organizer on or before November 25, 2013 to coordinate their travel arrangements to Manila. Those who will not compete in the National Finals forfeit all their privileges. b. 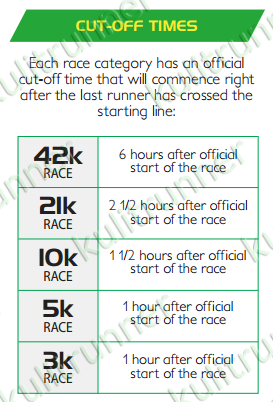 Participants finishing the race within the specified age-bracket and time below will qualify. All expenses related to their participation will be shouldered by the qualifier. *All expenses related to their participation will be shouldered by the qualifier. 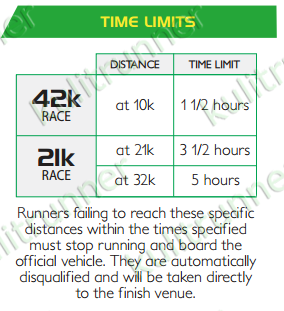 Metro Manila qualifiers from the 42.195-K race and provincial qualifiers from the 21-K race CAN NO LONGER compete in any of the elimination races. They will not be accepted even in shorter distance races. They may only compete in the full marathon of the National Finals. All winners in the 21-K, 10-K, 5-K, and 3-K races (top 10 male and female) CAN NO LONGER compete in any of the succeeding elimination races. 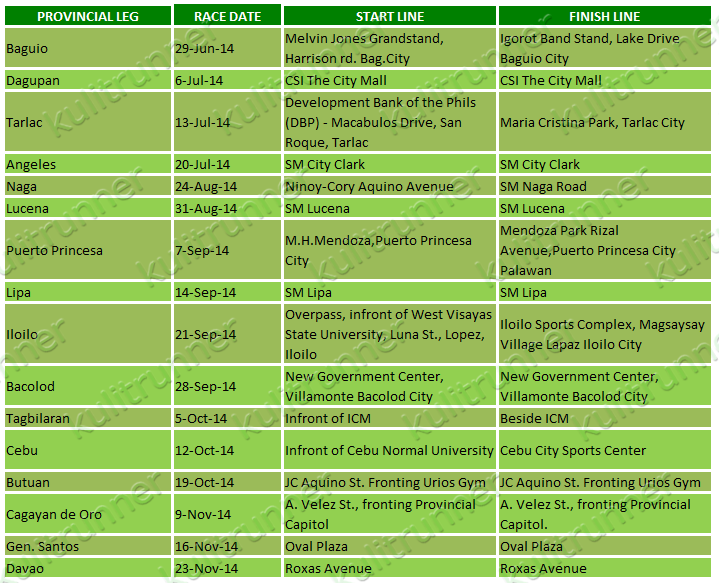 However, they (excluding the qualifiers) can compete in the 21-K, 10-K, 5-K, and 3-K races of the National Finals. 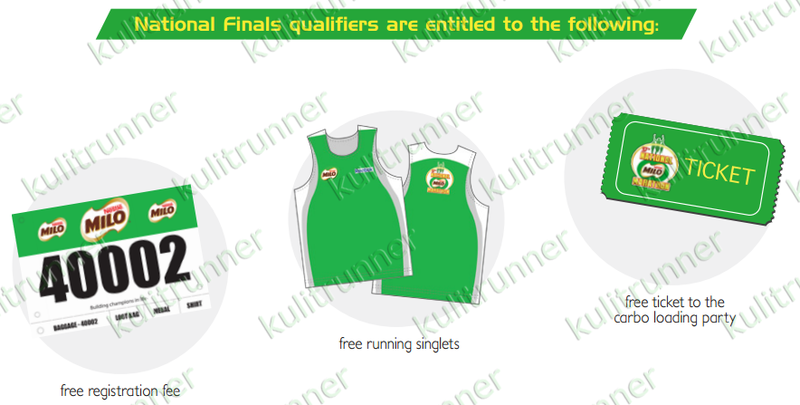 The 42.195-K and 21-K races of the National Finals will have two categories, Open and Local. Both overseas and local participants can compete and win in the Open category (only the top 3 winners will be recognized). In case a local participant finishes in the top 3 of the Open category, he/she waives the right to win the prize in the Local category. To qualify, overseas runners must provide proof of finish in any AIMS/IAAF accredited races dating back at least one (1) year before race day or they may qualify in the Manila elimination race. 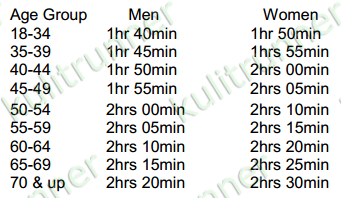 They must have a finish time within the specified age-bracket and time identified in items 18 (for 21-K) & 19 (for 42.195-K). 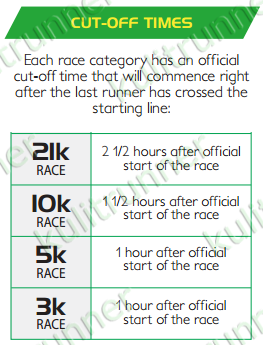 Finishers in all categories within the cut-off time will receive a certificate of finish. Winners must be physically present to receive their awards during the awarding ceremony. Uncollected prizes will be donated to the “HELP GIVE SHOES ADVOCACY” or disposed at the discretion of the race organizer. 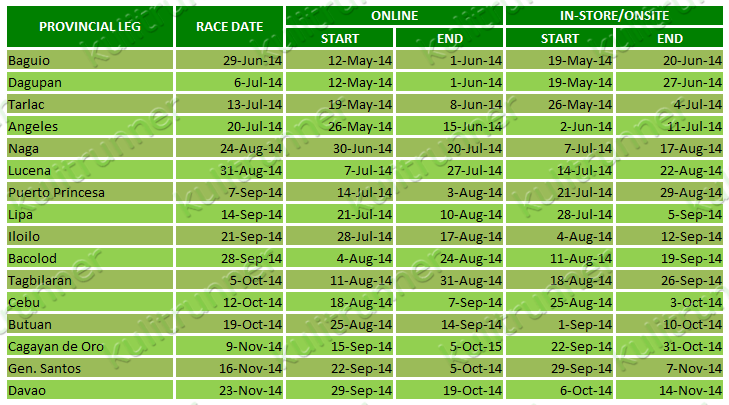 Results will be uploaded two (2) days after each race. Visit http://www.milo.com.ph for more details. It’s MILO Philippines 50th year anniversary this year! To celebrate, they continue with their passion of building a nation of champions by supporting the country’s athletic community through grassroots sports development. 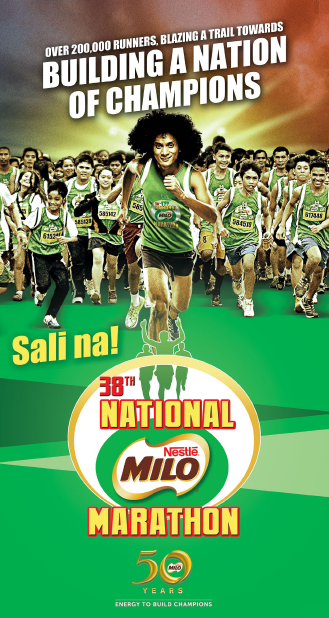 This includes the holding of the annual National MILO Marathon series of running races all over the country. 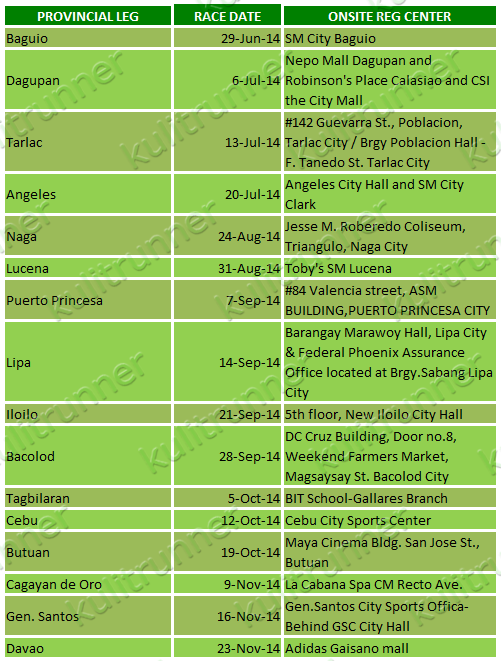 The much-awaited Manila eliminations leg will be held on July 27, 2014. Read on the post below for the important race details. Qualifying race for Manila Elimination race is 42km category. Participants must be 18 years and above on the race day to participate in the Full Marathon (42.195-K) and Half Marathon (21-K). Each will have to secure an official ‘Fit-To-Run’ medical certificate signed by a licensed physician within 2 months before race day. Baggage deposit services will be available exclusively for 10km, 21km and 42.195km participants only. 3km and 5km race category participants are strongly encouraged not to bring any type of bag(s) on race day. 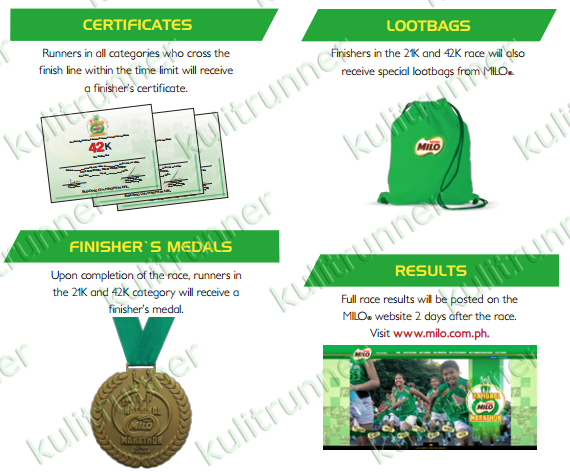 Fastest Filipino 42.195K winners (male & female) will be dubbed as the 2014 MILO® Marathon King and Queen respectively and will be given the opportunity to compete in an international race outside the country. All expenses will be shouldered by MILO. 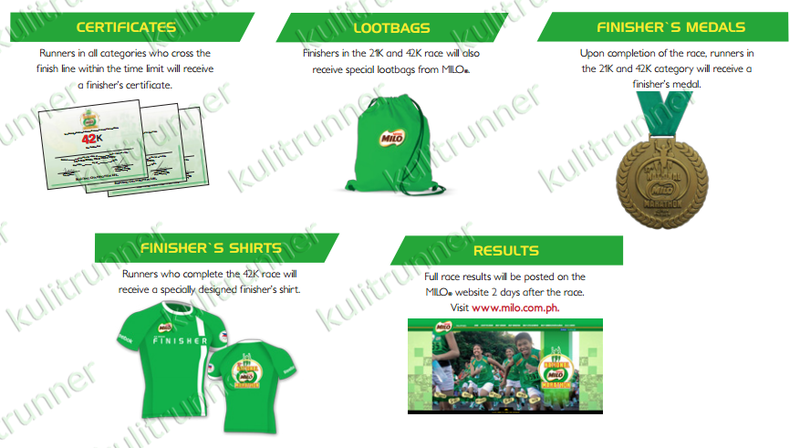 All 42.195K finishers within the cut-off time will receive a medal, a loot bag, and an exclusive finisher’s shirt. 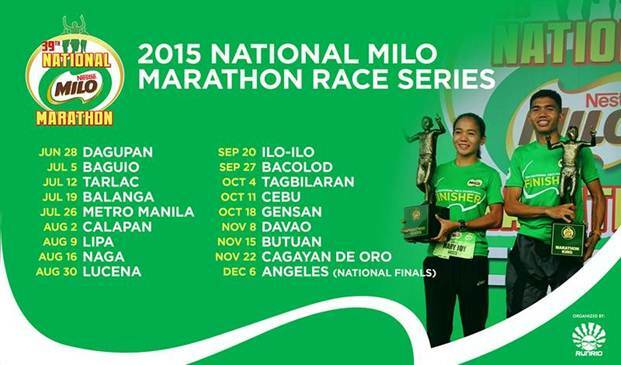 *Download National MILO Marathon Rules and Regulation for details of each side event.